Copyright 2015 by the authors Licenced under Creative Commons Attribution license (CC BY 4.0)((http://creativecommons.org/licenses/by/4.0/). Satellite and airborne optical sensors are increasingly used by scientists, and policy makers, and managers for studying and managing forests, agriculture crops, and urban areas. Their data acquired with given instrumental specifications (spectral resolution, viewing direction, sensor field-of-view, etc.) and for a specific experimental configuration (surface and atmosphere conditions, sun direction, etc.) are commonly translated into qualitative and quantitative Earth surface parameters. However, atmosphere properties and Earth surface 3D architecture often confound their interpretation. Radiative transfer models capable of simulating the Earth and atmosphere complexity are, therefore, ideal tools for linking remotely sensed data to the surface parameters. Still, many existing models are oversimplifying the Earth-atmosphere system interactions and their parameterization of sensor specifications is often neglected or poorly considered. 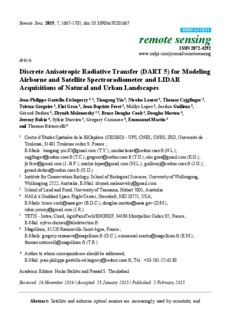 The Discrete Anisotropic Radiative Transfer (DART) model is one of the most comprehensive physically based 3D models simulating the Earth-atmosphere radiation interaction from visible to thermal infrared wavelengths. It has been developed since 1992. It models optical signals at the entrance of imaging radiometers and laser scanners on board of satellites and airplanes, as well as the 3D radiative budget, of urban and natural landscapes for any experimental configuration and instrumental specification. It is freely distributed for research and teaching activities. This paper presents DART physical bases and its latest functionality for simulating imaging spectroscopy of natural and urban landscapes with atmosphere, including the perspective projection of airborne acquisitions and LIght Detection And Ranging (LIDAR) waveform and photon counting signals.